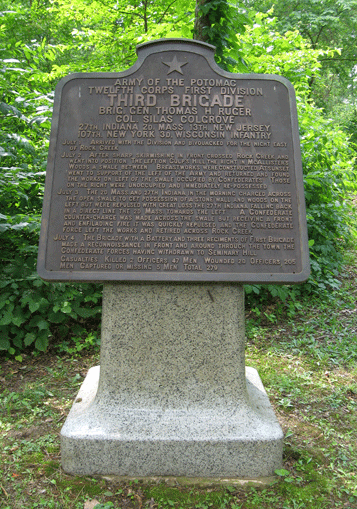 The monument to the 3rd Brigade, 1st Division, 12th Corps of the Federal Army of the Potomac is on Colgrove Avenue southeast of Gettysburg. The brigade was commanded at the Battle of Gettysburg by Brigadier General Thomas Ruger (USMA ’54), a Wisconsin lawyer originally from New York. 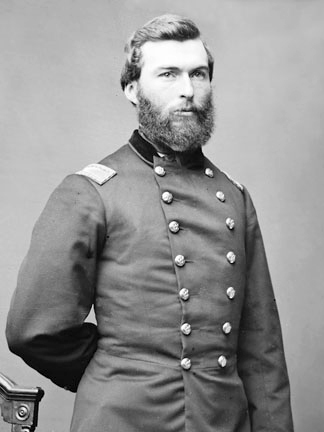 At the beginning of the battle Twelfth Corps commander Henry Slocum was put in charge of the right wing of the army, giving Alpheus Williams temporary command of the corps and Ruger temporary command of the First Division. Colonel Silas Colgrove took over the brigade as senior colonel. Attached to the 1st Division, 12th Corps, Army of the Potomac. July 1. Arrived with the Division and bivouacked for the night east of Rock Creek. July 2. After sharp skirmishing in front crossed Rock Creek and went into position. The left on Culp’s Hill the right in McAllister’s Woods a swale between. Breastworks were constructed. At sunset went to support of the left of the Army and returned and found the works on left of swale occupied by Confederates. Those on the right were unoccupied and immediately repossessed. July 3. The 2d Mass. and 27th Indiana in the morning charged across the open swale to get possession of a stone wall and woods on the left but were repulsed with great loss the 27th Indiana falling back in a direct line the 2d Mass. towards the left. 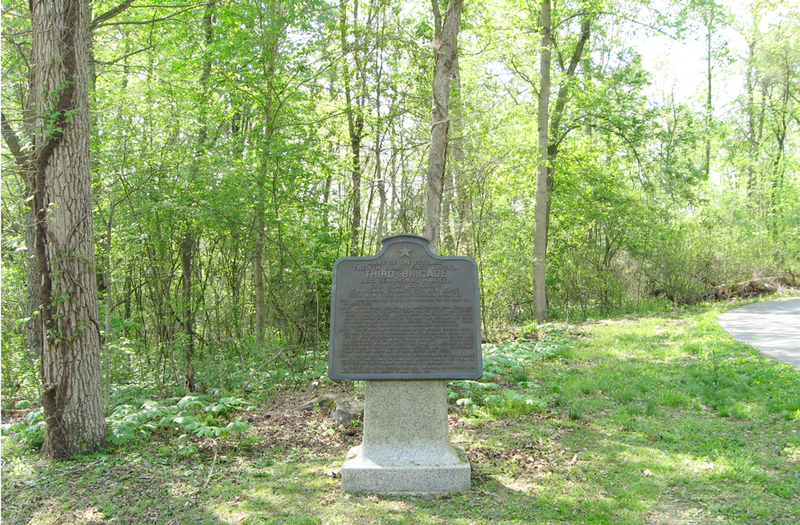 A Confederate countercharge was made across the swale but receiving a front and enfilading fire it was quickly repulsed and the Confederate force left the works and retired across Rock Creek. July 4. The Brigade with a battery and three regiments of First Brigade made a reconnaissance in front and around through the town the Confederate forces having withdrawn to Seminary Hill.